In projectile motion, the horizontal and the vertical components of the motion are treated separately. A projectile moves both horizontally and vertically. Its horizontal motion is constant. Its vertical motion is affected by the acceleration due to gravity. The only variable shared by both types of motion is time. Every point on the trajectory is the vector sum of the horizontal and the vertical components of the velocity. The speed of an object at any point on the trajectory can be found by calculating the horizontal and vertical velocity components at that point. The speed is the vector sum of the components at that point. An object projected horizontally (projected perfectly parallel to the surface) will reach the ground in the same time as an object dropped vertically. Since speed at any point in a trajectory is the vector sum of the horizontal and vertical velocity components at that point, the projected object will have a greater speed when it strikes. The maximum range for a given initial velocity is obtained when the angle of projection is 45°. It is very important to consistently define directions in projectile motion. If the acceleration due to gravity is defined to be negative, then all velocities in the "down" direction are also negative. If displacement is measured from the ground up, it is positive. If it is measured from the "top" down, it is negative. The general equation of motion, d = vit + � a t2, can be easily used to calculate vertical displacement and/or time at any point in a trajectory. First, find the initial vertical velocity component. If horizontal distance is known: Use the horizontal velocity component to calculate time in the air to that point in the trajectory. Substitute in the general equation of motion and solve for vertical displacement, knowing initial vertical velocity component. If vertical displacement is known (remember it is positive when measured from the ground "up" to the point in the trajectory): Use the general equation of motion to solve for time to that point in the trajectory knowing initial vertical velocity component. Calculate the total time the object is in the air by using the general equation of motion and the initial vertical velocity component. Remember, when the object "hits" the ground, its vertical displacement is zero. We will be working two types of problems. The first type of problem involves an object that is thrown or projected at the top (or apex) of its trajectory (at point B in the picture). At this point, the vertical velocity is zero. Since it starts at this point, we let vi = zero. It accelerates vertically downward at a rate of -9.8 m/s2. We usually use the first acceleration formula listed to find the time the projectile is in the air. The time that it travels vertically is the same as it travels horizontally. We can use this time to determine its horizontal range. Its vertical displacement is given by distance BD and it is negative. Its horizontal range is given by distance DC. In this case, q = 0°. Thus, cos q = 1 and sin q = 0 which makes the initial vertical velocity component equal to zero and the horizontal velocity component equal the the horizontally projected velocity. Consider this problem: An object rolls down an incline and then off the edge of a cliff. Motion information is given allowing one to calculate to speed and angle with which the object leaves the edge of the cliff. Find the initial vertical and horizontal velocity components at the edge of the cliff. Remember, the object is going down, so the sign of the initial vertical velocity component is negative. If the height of the cliff is known, the time to fall can be calculated using the general equation of motion, the initial vertical velocity component, and the acceleration due to gravity. Once time to fall is known, the horizontal velocity component can be used to calculate the distance the object strikes from the base of the cliff. One can also calculate the vertical velocity component the instant before it strikes the ground. It can be used to determine the speed and angle with which the object strikes the ground (remember, it is the vector sum of the horizontal and vertical velocity components at that point). At pointB, its vertical velocity component is zero. The acceleration at all points is -9.8 m/s2. 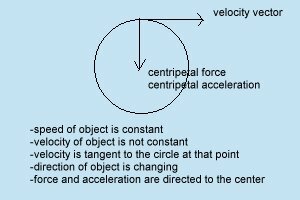 At point B, the object is accelerating (even though its vertical velocity is zero), because its direction is changing. At all points in the trajectory, the horizontal velocity component remains the same (in the absence of air friction). We will work these problems by finding total time in the air using the second acceleration formula. vf at point C is numerically equal to vi at point A but of the opposite sign. Remember, velocity is a vector quantity! Once we have total time, we can use d = v t to find the horizontal range, knowing that this uses the horizontal velocity componet. We can use the last acceleration formula to predict the maximum vertical displacement (working from points B and D). where v is the projectile velocity, q is the projectile angle, and g is the acceleration due to gravity. A virtual lab in which the user can control the angle of the cannon. Cursor interrogation allows maximum vertical height and total horizontal range to be determined. A target is provided for amusement. These two types of problems can also be solved graphically using parametric equations on the graphing calculator. If you are interested in learning how to do this, it is explained in the link below. Where l is the length of the pendulum and g is the acceleration due to gravity at that point. For a pendulum, speed is zero and acceleration is a maximum at the point of maximum displacement (point A). For a pendulum, speed is a maximum and acceleration is zero at the equilibrium point (point B). An object moving in a circle of radius r with constant speed v has an acceleration whose direction is toward the center of the circle adn whose magnitude is aR = v 2/r. Acceleration depends upon speed and radius. The greater the speed, the faster the velocity changes direction; the larger the radius, the less rapidly the velocity changes direction. Since the acceleration is directed toward the center of the circle, the net force must be directed toward the center of the circle too. The net force must be applied by other objects. You can use your graphing calculator to determine how the magnitude of the centripetal force varies the speed with which the object is swung in the horizontal circle, the mass of the object, or the radius of the horizontal circle. Kepler's First Law: The path of each planet about the sun is an ellipse with the sun at one focus. Kepler's Second Law: Each planet moves so that an imaginary line drawn from the sun to the planet sweeps out equal areas in equal periods of time. Kepler's Third Law: The ratio of the squares of the periods (the time needed for one revolution about the sun) of any two planets revolving about the sun is equal to the ratio of the cubes of their mean distances from the sun.